Wood is a excellent source of renewable heat energy and, if burned efficiently, produces virtually no smoke. 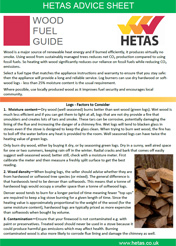 At Bentley Fire Shop we stock heatlogs, which are clean, convenient and natural alternatives to traditional fire wood – ideal for wood burning and multi-fuel stoves. They can also be used in open fires, as well as garden chimineas, providing patio heating that is environmentally friendly. Sold in 10 KG Packs (12 Logs per pack), the product is conveniently packaged and easy to stack, store and handle. The heatlog briquettes are made from pure shavings from sawmills, using 100% virgin timber from sustainably managed plantation forestry. We also supply bags of kindling, as well as 10kg bags of Homefire E-Coal.